NetSquared's goal is to create local nonprofit tech communities of practice in every city in the world. Sounds impossible? Maybe! But we think we can do it because our model of self-directed leadership means that we can scale easily with minimal staff investment. Just one TechSoup staffer has supported NetSquared as it has grown to 70+ groups reaching 13,000 nonprofit techies each year. However, our model doesn't mean groups magically sustain themselves with no support. NetSquared local chapters are healthier when they receive a steady dose of event ideas, peer mentorship, and cheerleading. But our growth has spread the NetSquared Community Manager's time very thin, plus our ability to support people in their own language, time zone, and offer local connections has been a challenge as the network has expanded to 24 countries. That's why we created the NetSquared Ambassadors, who are veteran organizers who have stepped up to provide regular mentorship and support for new and established groups in their region. What Do NetSquared Ambassadors Do? Offer regular mentorship and support to current and prospective organizers in their region via monthly communication. Recruit and onboard new NetSquared groups. Support the Community Manager with their knowledge of local languages and cultural context. Share regional nonprofit tech news that might be of interest to NetSquared organizers. Act as TechSoup’s eyes and ears in their region. Help direct the development of the NetSquared community, ensuring that the TechSoup continues to improve our support for the NetSquared network. The NetSquared Ambassador program has evolved over three years from a pilot project to a key part of NetSquared. There are now eight NetSquared Ambassadors serving almost every region of our network. Ambassadors are how we provide NetSquared organizers the hands-on, face-to-face support that is the essence of NetSquared. Since we can't bring all our organizers together every year (too expensive!) we instead hold Ambassador-led regional gatherings and one-to-one meetings to share best practices and mentorship. This investment is paying off in a big way. We've been tracking the number of new organizers and new/reactivated groups over 2016 to get a sense of the value NetSquared Ambassadors bring to the network. What we discovered was surprising. The NetSquared Ambassadors referred 40 new organizer leads 2016. I created 122 new organizer records in 2016, so that means 1/3 of new NetSquared organizer leads came directly from Ambassadors! 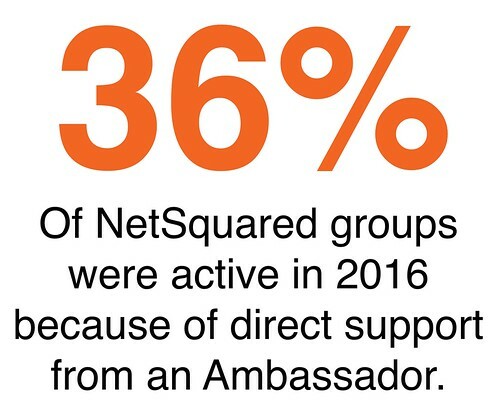 27 NetSquared groups received direct support from an Ambassador, resulting in a new or restarted group. With 74 active groups in the last year that means 36% of active groups can be attributed to the support of their local Ambassador. But that's not the end of the story. I've been claiming credit for the growth of NetSquared over the past four years. But when I look at the growth statistics for the last fiscal year it shows that NetSquared's growth of 22% is less than the number of activated groups from the contribution of the Ambassadors. So NetSquared's recent growth can be entirely attributed to the work of the Ambassadors! The NetSquared Ambassadors are driving NetSquared's growth, and that's before we mention their contributions as trainers, webinar leaders, and mentors at events like our Africa and Europe gatherings or the annual NTC conference. You can read more about how NetSquared is building the tech for good community in the most recent annual report. What have we learned from the NetSquared Ambassador program and how we can improve it next year? The model works. How we can expand it to the rest of NetSquared? Face-to-face trainings are very important. Failing that, picking up the phone works magic! Ambassadors are ideally placed to help facilitate the delivery of grant programs and train-the-trainer workshops. we need a constant flow of funds to help Ambassadors, rather than sporadic grants. Keep regions small. The USA regions are too spread out, as is Latin America. Strengthen the connections between the Ambassadors and TechSoup/Global Network Partners. Additional support and facilitation in languages other than English (especially French and Spanish) and availability during work hours in Europe/Africa time zones. Support materials and workflows need to be properly documented and shared. If the Ambassador program is already so successful that it's driving a third of NetSquared growth, just think what we can do when we iron out the kinks! I talk about my approach to the NetSquared Ambassador role in this interview with the Mobilisation Lab as part of their Beyond the First Click report on how volunteers can build power for movements and NGOs. TechSoup and NetSquared are deeply grateful to the Ambassadors for their contributions to the tech for good community.